Own 10 Copies of EarthBound! A bunch of interesting EarthBound stuff this past week, hurray! I wonder if Itoi ever imagined that there’d be such a crazy MOTHER series following outside of Japan. It’s interesting how it has such a strong community outside of Japan, and we only got ONE of the games! The way that games create fans, but fans keep games alive is an interesting phenomenon indeed. Probably the biggest site-ish news this week was my update on the progress of the MOTHER 1+2 fan translation. Basically, the first draft is done now. The Speed Gamers’ MOTHER marathon last week raised over $10,000+ for charity! Flint is the most popular main father in the MOTHER series! EarthBound boxes cost more than the games themselves?! Very kickass MOTHER 3 cosplay! As always, you can check to see what EarthBound/MOTHER stuff is currently on eBay at any time here! MOTHER 2 cartridge for only $8.99! Cheap MOTHER 3 cart, complete! MOTHER 3 Deluxe Box for only $150!! 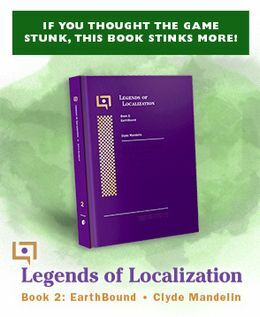 EarthBound + Box + Guide – free shipping too! Official MOTHER 2 game book for $29.95 – extremely rare, comes with a poster inside! Cheap, unopened MOTHER 3 Deluxe Box! Portuguese stuff about the MOTHER 3 translation, etc. What if you had never played EarthBound? Whoa, man! Mani-Mani Tales comic series updated! Remember, if you’ve done something cool EarthBound-related or if you know of something cool that’s EarthBound-related that belongs here, let me know! Itoi mentioned this week that he thinks newborn babies are ugly, and he’ll honestly say that to people, not meaning to hurt their feelings or anything, it’s just the truth. But just a little while after, after they’ve grown, they seem much cuter to him and he’ll say that too. This entry of his was kind of funny and interesting, I might translate it someday. 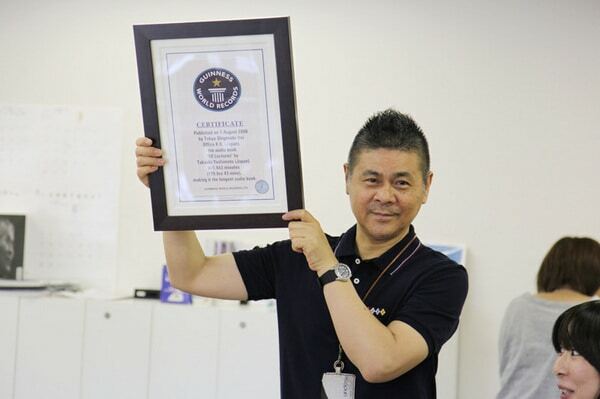 This week, Itoi’s company got the world record for longest audio book – 115 hours and 43 minutes. Basically, there’s this old, wise guy that Itoi’s really fond of, and over the course of many years, they recorded tapes and tapes of the guy just talking about life and everything else. Itoi really looks up to the guy and is always talking about him on his site. Anyway, they were all recently put into audiobook form. Still, 115 hours… geez. This week, expect some cool MOTHER tricks/glitches, a video someone beating MOTHER 1 in like 40 minutes, some music stuff, and possibly a better design for my MOTHER 2 vs. EarthBound stuff that will look a little more like the old design. And then the usual daily stuff of course. We’re also getting close to the day the ROID service starts in Japan, so we might learn more about that EarthBound-lookalike game! Whew. Finally managed to get that MOTHER 1 first draft done. Too bad I don’t have the energy from that MOTHER 3 project anymore, or the MOTHER 1 patch would’ve been out long ago. I blame age and the fact that MOTHER 3 sapped away my energy. In some ways, the translation for MOTHER 1 is harder than MOTHER 3, too, which I found interesting. How I wish a VWF were possible for MOTHER 1. Anyway, thus ends the 19th week of EarthBound Central! I think the reason you dont have the pizazz for the mother1+2 as opposed to mother3 is we’re not DYING for a translation. A lot of us have played Earthbound Zero, so I wouldn’t think my life to be completely over if this takes a while, y’know? This week wasn’t too heartbreaking, or too exciting, or “How much is he selling that for? !”, but it was kind of relaxed. And honeymustard, congratulations on the Deluxe Box! Yeah newborns look like aliens. I saw my cousin minutes after he was born, his eyes were bugging out even though they were closed and he still had a cone head. But now he’s the cutest little kid you’ll ever see. Oh yeah and you said on twitter that this site shows up on page 1 in searches for “EarthBound” and I want to confirm that it’s the same for me over here too! Newborns look like lizards. Old people, too. Newborn babies are ugly…once you wash ’em off and wrap ’em in something cute, then they’re adorable. But still, some babies are just ugly anyway. Some people say “There is no such thing as an ugly baby”, but they’re wrong…I’m sorry, some babies are ugly. You know what’s even sadder? Some of those ugly babies even grow up to become ugly children, then ugly adults. People tend to marry people similar to themselves, so they marry and reproduce with another ugly person and yet another ugly baby is born. The cycle of repulsion continues for another generation. Luckily, most babies grow out of any ugliness caused by things such as cone-shaped heads or jaundice and this isn’t a problem. @Spitball Sparky: Haha. Well put. Honeymustard, so you’re the jerk! Congrats on getting that so fast. $150 for the box set is crazy.